Guest post by Matthijs van Til, co-founder of Readaar. Three years ago, my co-founder Sven Briels and I had a vision: we saw governments and other organizations buying aerial imagery. None of them actually wanted the aerial images. Instead, they were looking for data and spending a lot of time and money collecting useful information. We thought there should be a better way to service these organizations. So we started Readaar. Our business model is simple: we buy imagery and sell data. We collect data from images using remote sensing, object recognition, and machine learning. Of course, we’ve had our setbacks. But one aspect turned out to be a lot easier than expected: selling to local governments. We’d originally projected high cost of sales for each job, but in the end, we didn’t have to spend any of it. Readaar was initially conceived as an asbestos-detection tool. The Netherlands has a mandate to eradicate asbestos roofing by 2024, and local governments are responsible for enforcing this ban. To achieve this is a multi-billion euro operation, but to do so effectively, the first thing you need to be able to do is uncover where asbestos is currently in use. This is something you can pretty accurately estimate from aerial imagery, which made it an interesting market for us. Our bottoms-up approach started by getting in touch with people in local government, who were somehow involved in policy setting regarding the asbestos ban. LinkedIn was extremely useful for finding and contacting these people, while we chose to approach them as experts to validate our product. As you know, this works a lot better than “selling,” and we found that many of them were willing to help. We discussed—not pitched—our idea and managed to sell five paid pilots, spread all across the country. Be smart about budget & timing: Under a certain threshold (up to €10k) you can do business quite easily, especially at the beginning (new budget) and end (remaining budget) of the fiscal calendar year. It really isn’t more difficult than selling to an SME. Local governments are willing to experiment: They ask for fewer guarantees up front than a private business will for a paid pilot, so there’s more room to fail. This really helped us improve our data quality fast. Of course this willingness doesn’t ring true for every civil servant, so move on quickly if you notice your contact is not an early adopter. Staying loyal to your first customers pays off: When we improved our product later on, we gave our early adopters free updates. By keeping these customers satisfied, we got fantastic ambassadors. A big difference between B2B and B2G is that happy business customers want to keep their “competitive advantage” a secret, whereas governments share! These early adopters became the folks who were being asked to speak at conferences and tell their success stories. As a result, we got a lot of business through referrals. Choose wisely. Go for it, or don’t participate. It requires a lot of time to write a good proposal, so only participate when you have a decent chance of winning. Most tenders are not for you. Have a proof of concept. Governments tend to choose the safe route, i.e. a proven product. When the first tender was published, we had already completed projects with eight municipalities. Based on our results, we won the first tender. If you don’t have any proof, reconsider participating. Don’t be the fish. A popular poker saying states, “If you don’t know who the fish is, then you are the fish.” You don’t want to be the “last party” at the table, just because the tenderer is required to get a certain number of offers. You want to be in contact with your prospect way before the tender is made public; for us, our first contact was typically made one year before publication. You need to be in contact to steer the “question,” make sure the RFP is in favor of your solution. You’ll also learn what’s really important for them and what your chances are. If you’re surprised by the RFP, be really careful: there’s a big chance that others have already been in contact. Calculate all scenarios. A tender typically comes with a predefined way of scoring price and quality. Create a spreadsheet and fill in your projected scores, prices and those of your competitors. Multiple times we made changes to our proposal based on this and won the project at higher prices than our competitors offered, but only because we could offer a higher quality product. We now service 114 out of the 380 municipalities operating in the Netherlands. So our beachhead in the Netherlands is too small to really scale. And although much of the data we can collect (construction properties, solar panels, etc) is interesting for organizations outside of the Netherlands as well, we can’t always deliver this because aerial imagery isn’t available in many places. This is one of the reasons why we’re now starting to use satellite imagery. To get some help with this, we joined the Business Incubation Centre (BIC) of the European Space Agency (ESA). As a partner to the ESA BIC program, AWS offers business advice, financial support and technical expertise to the startups accepted into the ESA BIC incubator, which is a nice bonus. If you’ve got a space tech-related startup and are interested in joining ESA BIC Noordwijk, the application deadline for the next cohort intake is 15 March. 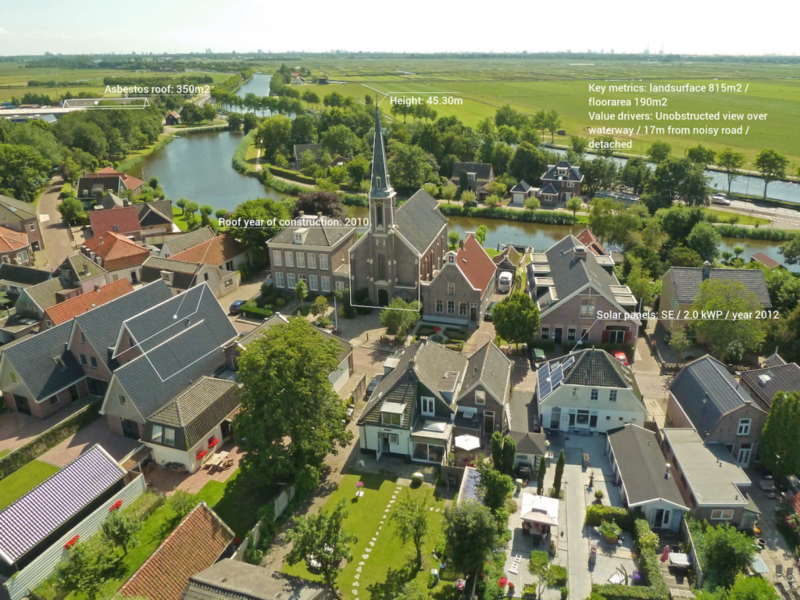 And of course, if you’re a (local) government outside the Netherlands that’s looking for high-value data based on aerial imagery, we would be happy to speak to you.